Officials are now investigating 252 cases of possible acute flaccid myelitis (AFM), including 90 confirmed cases in 27 states, according to the Centers for Disease Control and Prevention. The number of cases under investigation by the CDC is up 33 from last week, and the number of confirmed cases rose by 10, Dr. Nancy Messonnier, the director of CDC’s National Center for Immunization and Respiratory Diseases, told reporters Tuesday. Acute flaccid myelitis is a condition that has polio-like symptoms such as partial paralysis. The virus mostly affects children and young adults. The CDC said they do not know why the condition is impacting these individuals, but many believe it is caused by viruses. The CDC emphasized it remains a rare condition and said there have been no reported deaths from AFM so far in 2018. An infographic distributed by the Centers for Disease Control and Prevention on "How to Spot Symptoms of Acute Flaccid Myelitis in Your Child." 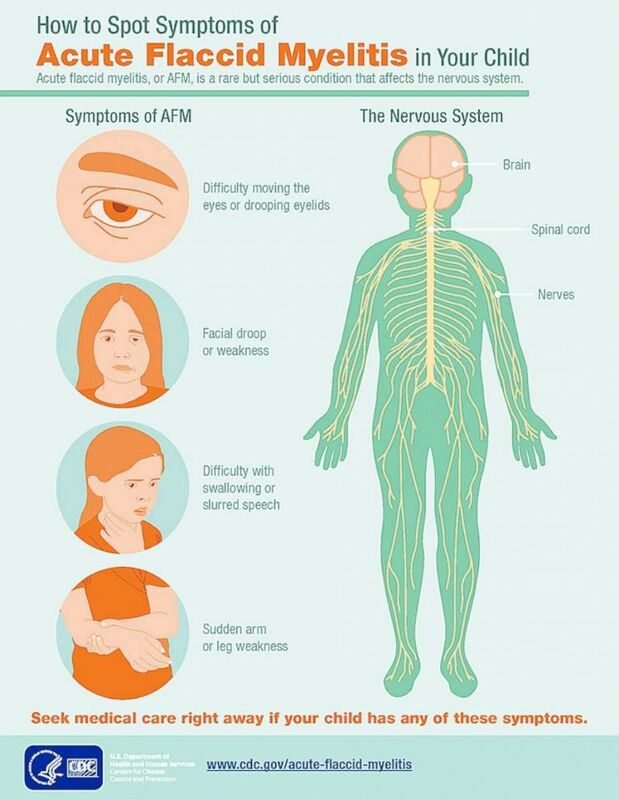 The typical symptoms of AFM are similar to those of a severe respiratory illness, along with a fever, but then progress into neurological symptoms. Some patients with AFM feel weakness in their arms or legs, a loss of muscle tone or slower reflexes. Some patients may also exhibit facial droop or weakness, difficulty moving their eyes and drooping eyelids or difficulty with swallowing or slurred speech. The most severe symptom is respiratory failure. Messonnier said the CDC doesn't yet have enough information to definitively say what causes AFM and are casting a wide net for information. Part of that is studying the long-term health of AFM patients. Scientists are also looking for a pathogen in AFM patients' spinal fluid, but haven't yet found a pathogen that's a clear cause, she said. The CDC said it sees an uptick in AFM cases every two years, and so far, the curve of the cases being investigated this year looks very similar to that of 2014 and 2016. Officials don't expect many more cases in 2018 compared to 2016 and 2014, Messonnier said. The best advice available is to wash your hands regularly, which lowers the chances of getting sick or spreading germs from many of the viruses linked to AFM, and protect against mosquito bites by using repellent, in addition to staying indoors at dusk and dawn. The CDC said the vaccines your pediatrician suggests are very effective and children should continue to receive them on schedule even though there is no vaccine for AFM.